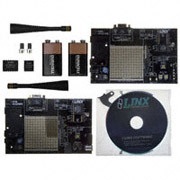 This Master Development System provides the most complete opportunity to evaluate the Linx ES Series modules and then begin the integration of them into your own design. It features an on-board encoder / decoder with buzzer and relay outputs, which allow range and interference testing in anticipated use environments. When you are ready to begin development, a convenient prototyping area with breakout headers and regulated power supply allows for rapid testing and interface. For applications requiring software development, an on-board RS-232 serial interface and demonstration software are provided. Finally, when you have integrated the modules into your own product, the system will continue to serve as a valuable benchmark to compare the performance of your own layout and design.